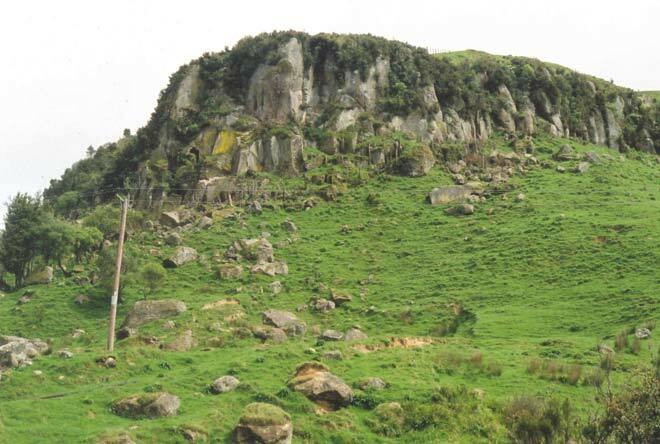 Welded Ongatiti ignimbrite is exposed in steep cliffs capping the hills near Te Kūiti. Originally erupted as an enormous cloud of incandescent ash and pumice about 1.2 million years ago, the ignimbrite blanketed the landscape in the central part of the North Island. Now exposed by erosion, the ignimbrite rests on top of mudstone, which is almost entirely covered by grass. Fallen blocks of ignimbrite litter the hillside.